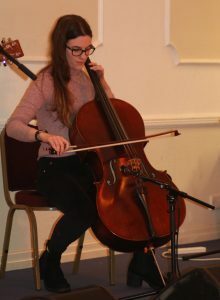 Local quartet Drogh Yindys was selected to represent the Isle of Man at the annual Pan Celtic International Song Contest in Letterkenny, County Donegal, during the local heat Arrane son Mannin at the Masonic Hall in Peel recently. 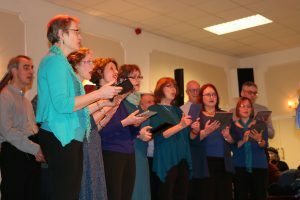 The song Yn Faageyder (Leaving Thee) focuses on leaving the Isle of Man, and as a group Drogh Yindys has a number of connections to Kirk Michael on the west coast; including singers Jo and Juan Callister, his sister also named Jo on whistle and fellow musician Katie Lawrence on keyboard. 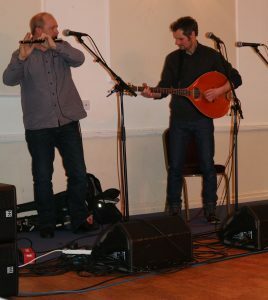 The song was originally composed in English by their father John ‘Dog’ Callister and translated into Manx Gaelic by Phil Kelly, both of whom are also connected with Kirk Michael. 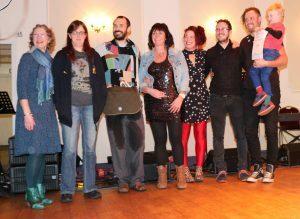 The local heat, Arrane son Mannin (Song for Mann), provided a great chance for Island musicians to present an original song in the Manx language, encouraging diversity and innovation amongst singer/songwriters. As well as the competition itself (with prize money sponsored by Culture Vannin) a large and enthusiastic audience enjoyed a varied evening of Manx entertainment, including BBC Radio 2 Young Musician of the Year Mera Royle, local singer/songwriter Matt Creer and the Manx Gaelic choir Caarjyn Cooidjagh.